Synthetic polymers are employed in the fabrication of medical implants and devices used in replacing biological tissues or to improve the functioning of organs in the body. In many of these devices synthetic polymers were adopted from other areas of science without substantial research for medical use leading to less than optimum performance. In the 1990s Dr Thilak Gunatillake and his CSIRO colleagues focused their research to address the material needs for next generation medical implants and were successful in developing a family of biostable polyurethanes – Elast-Eon® – for use in a variety of medical implants designed for long-term functioning in the body. Commericalised by spin off company Elastomedic (now AorTech Biomaterials), Elast-Eon® products and technologies will help millions of people worldwide who due to disease, trauma or congenital defects rely on medical devices and implants to improve their health and quality of life. For these discoveries Thilak Gunatillake was awarded a Sir Ian McLennan Award in 2002 and, with the polyurethane team, the inaugural CSIRO Medal for Business Excellence in 2000. Many millions of people worldwide rely on medical implants or devices to help improve their health and quality of life affected by disease, trauma or congenital disease. For example, cardiac pace makers are implanted in patients with problems of cardiac rhythm management. Similarly, implants based on synthetic polymers are used in orthopedics, urology, and reconstruction surgery. Devices such as cardiac pace makers require continuous performance over a long period of time, and the materials used to fabricate such devices need to have the biocompatibility and biostability along with mechanical durability for optimum device performance. The global medical device industry is a multi-billion dollar industry, with the end device market in 2006 estimated to be in excess of £89 billion per annum. In the early 1990s, Dr Thilak Gunatillake and his colleagues Drs Gordon Meijs, Simon McCarthy and Raju Adhikari at CSIRO Molecular and Health Technologies began work on new synthetic polymers with molecular structural features to withstand the biological environment. They realised the need to develop new materials to address the short comings of the materials used at the time and to fullfil the material needs of emerging technologies. The research progam was conducted as part of the Cooperative Research Centre for Cardiac Technology during the period 1991 to 1998. Professor Laura Pool-Warren, Dr Arthur Brandwood and Professor Klaus Schindhelm of the Graduate School of Biomedical Engineering (UNSW) contributed to the biological evaluation of the new polyurethanes. With their understanding of the influence of the biological system on foreign materials and its mechanisms to destroy such materials they selected polyurethanes as the best family of materials to incorporate segments that address the biocompatibility, biostability, mechanical property and processing requirements. This was achieved by incorporating siloxane segments as part of the polyurethane structure. The initial discovery helped to further develop a range of new materials with mechanical properties ranging from soft elastomers to rigid materials to suit a wide variety of medical implants for both ‘soft’ and ‘hard’ tissue applications. Elast-Eon® represents this family of polyurethanes and is covered by a portfolio of 10 families of international patents. Prior to the development of Elast-Eon®, the scientific community struggled for 15 years to find a material strong enough and durable enough to withstand long-term implantation. In 1997, the spin-off company Elastomedic was formed to commercialise this new polymer, and a new polymer synthesis factory opened in October, 1999. In 2000, a UK company, AorTech, purchased Elastomedic, although keeping the Melbourne manufacturing plant open. AorTech has continued to develop and refine the Elast-Eon® polymer and has made major technological advances in its morphology, chemical characteristics and processability. In July 2006, the US FDA approved the Elast-Eon® for human use. The first human use was in gastroenterological implants. It is also used to insulate electrical leads of cardiac pacemakers manufactured by St Jude Medical, with nearly half a million of these devices implanted in patients. 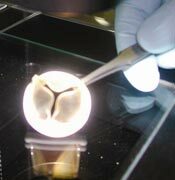 A number of other products including tri-leaflet heart valve are in advanced stages of testing. He and the polyurethane team also received the inaugural CSIRO Medal for Business Excellence in 2000. Gunatillake PA, 2008, Personal communication.